The birth of more than one baby from a single pregnancy; for example, twins or triplets. The birth of three or more babies from a single pregnancy is called a higher order multiple birth. Before the advent of assisted reproductive technology (ART), including fertility treatments and in vitro fertilization, multiple births were uncommon. Twins occur spontaneously in 1.6% of live births, and triplets and higher-order multiples even more rarely. Currently, multiples account for 2.9% of live births in LA County—95% are twins and the remainder higher order multiple births. Such multifetal pregnancies can put both mother and infants at risk. Mothers carrying multiple fetuses are 3 to 7 times more likely to experience complications during pregnancy, birth, or the period immediately following birth. Risks include preeclampsia, iron-deficiency anemia, uterine rupture, premature rupture of membranes, preterm birth, need for operative delivery, postpartum hemorrhage, and postpartum depression. Infants born of multifetal pregnancies are 4 to 10 times more likely to experience complications, including intrauterine growth restriction, preterm birth, low birthweight, and cerebral palsy. Infant twins are 4.5 times more likely to die—and triplets 9 times more likely—most often due to complications of preterm birth. Risk of infant death increases with the number of fetuses in the pregnancy. 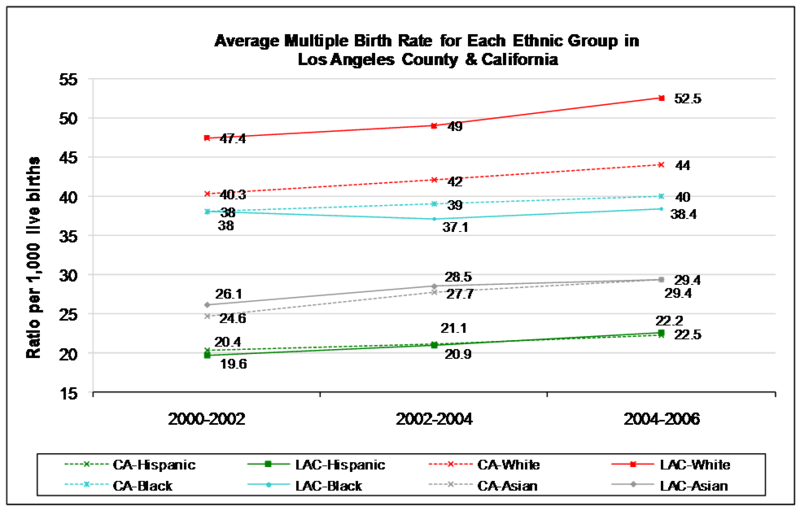 In general, from 2000 through 2006, the average rates of multiple births steadily increased across all ethnic groups in L.A. County and California. From 2000 to 2006, Hispanic women in L.A. County had the largest increase (14.8%) of deliveries of multiples as compared to white, Asian, and black women in the same area. From 2000 to 2006, African American women in L.A. County had the smallest increase (1.05%) of deliveries of multiples as compared to white, Asian, and Hispanic women in the same area. From 2000 to 2006, white women in L.A. County experienced a 10.8% increase in deliveries of multiples, while white women in California experienced a 9.2% increase in births of multiples. Sources: National Center for Health Statistics, final natality data. Retrieved 12/14/09 from www.Marchofdimes.com/peristats. In 2005, 1.57% of all live births in Los Angeles County were multiple deliveries. In 2005, white women in Los Angeles County had the highest percent (2.7%) of multiple deliveries as compared to black, American Indian, Asian, Pacific Islander, and Latino women. However, Pacific Islander women had the highest rate of delivering triplets (0.17% compared to 0.13% for White women). In 2005, only 1.18% of Latino women had multiple deliveries. From 2004 through 2006, on average, there were 970 singleton deliveries, and 30 multiple deliveries per every 1,000 live births in Los Angeles County.